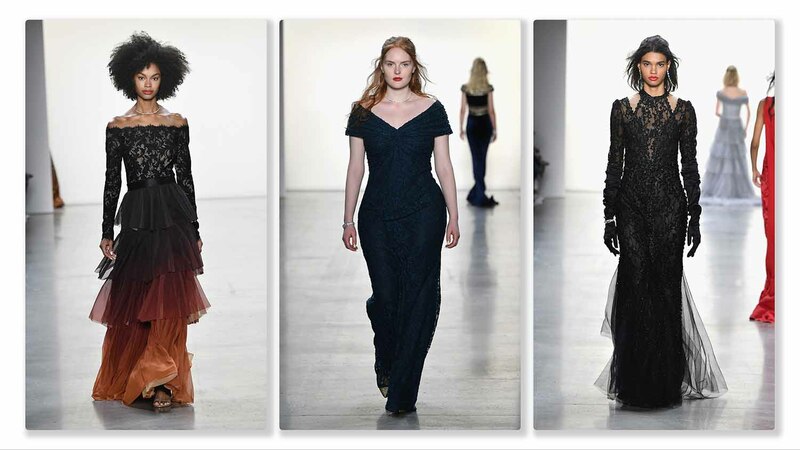 On the first day of New York Fashion Week, Tadashi Shoji took fashionistas to an Asian travelogue as he reinterpreted and reimagined the traditional dresses of South Asia while incorporating into it the magnificent landscape and wonderful blossoms of the region. Southeast Asia with its diverse landscape and culture is a kaleidoscope of shapes and color. From the palette of shiny gold stupas to the floating markets then to the elegant silk brocades arise graceful proportions. Luxurious one-shoulder folds hint at the shawl-like sabai, and a glimpse of a midriff entices a longer gaze. Buddhist monks inspire tailored draping that wraps around the body in flattering sweeps. Dazzling temples with rich ornamentation that reveal each culture’s artistic expression instigate architectural silhouettes. Pleated-tulle tiers with pronounced seams mimic the visual rhythms created by steep, layered roofs. Stupas with elaborate moldings and crown-like spires inspire detailed and intricate textures. This is exactly how his audience felt as each exit came to view, everyone promising more secrets to discover!